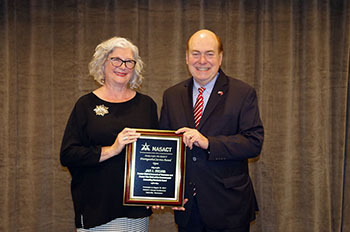 NASACT President and Tennessee State Treasurer David H. Lillard, Jr., recently welcomed state finance officials from around the nation to Nashville, Tennessee for the association's 102nd annual conference. Over 500 were in attendance, a record for recent history. 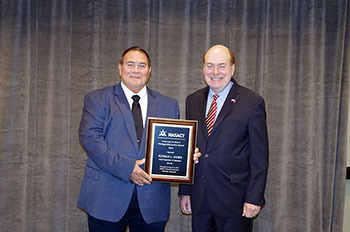 The conference was held August 12-16 at the Nashville Hilton Downtown. 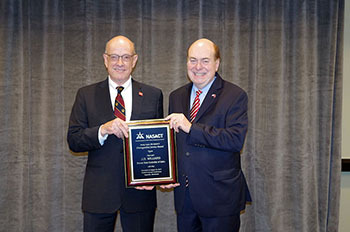 The conference was preceded on March 14 by a meeting of NASACT’s Executive Committee, as well as the Committee on Accounting and Financial Reporting. 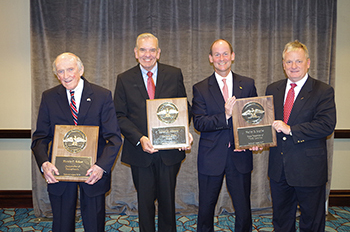 The conference featured six general sessions, with keynote speeches from renowned author Jon Meacham, NPR's Ron Elving, and National Governors Association CEO Scott Pattison, and 23 concurrent sessions covering a diverse range of topics. Find complete information about the program (including presentations and speaker bios) here. In addition, attendees were offered several special networking events, including evenings at the historic Ryman Auditorium and the Country Music Hall of Fame. 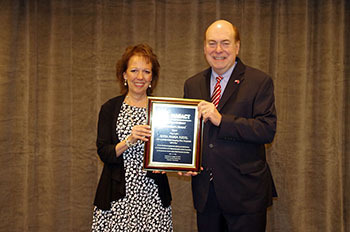 Two resolutions were approved at the conference during the annual business meeting thanking President Lillard for his service and commending the Tennessee hosts, which also included Comptroller of the Treasury Justin Wilson and Chief of Accounts Mike Corricelli, for their hospitality. 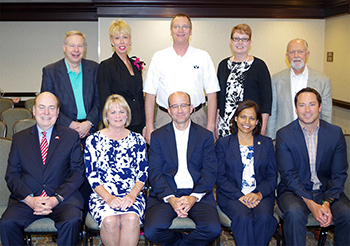 NASACT members elected a new Executive Committee for 2017-18, including new President Debbie Davenport, auditor general of Arizona. 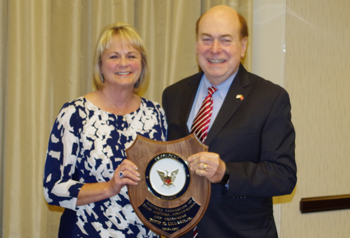 For her first order of business, new NASACT President Debbie Davenport presented a plaque of appreciation to David H. Lillard, Jr.
2017 Hall of Fame Inductees: Harvey C. Eckert, Robert H. Attmore, and accepting the honor on behalf of Harlan E. Boyles was his son Edward and current NC Treasurer Dale Folwell. 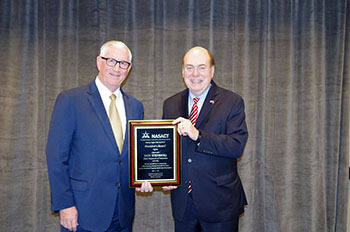 Distinguished Service Award Recipient Ronald L. Jones, chief examiner of Alabama (left) with NASACT President David H. Lillard, Jr. 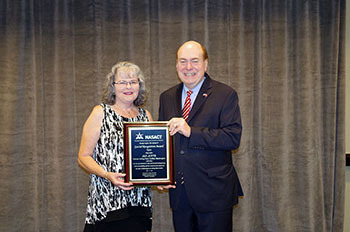 Distinguished Service Award Recipient Jan I. Sylvis, former vice chair of the GASB and former chief of accounts of Tennessee with NASACT President David H. Lillard, Jr. Distinguished Service Award Recipient J.D. 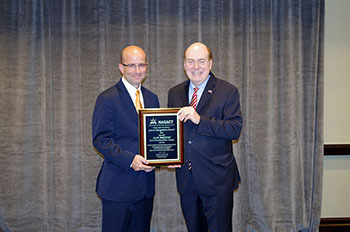 Williams (left), executive director with Infor Public Service, with NASACT President David H. Lillard, Jr.
Special Recognition Award Recipient Alan Skelton (left), state accounting officer of Georgia, with NASACT President David H. Lillard, Jr. Special Recognition Award Recipient Jan Jutte, former acting state auditor of Washington, with NASACT President David H. Lillard, Jr.
President's Award recipient Don Stenberg, state treasurer of Nebraska, with NASACT President David H. Lillard, Jr. President's Award recipient Stephen M. Eells, state auditor of New Jersey, with NASACT President David H. Lillard, Jr.
President's Award recipient Anna Maria Kiehl, state comptroller of Pennsylvania, with NASACT President David H. Lillard, Jr.
NASACT wishes to thank all those who helped with the conference, especially David Lillard and his staff. 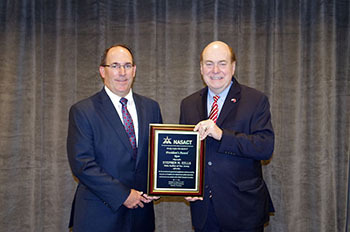 NASACT also wishes to thank all the speakers and moderators for sharing their time and expertise. Special gratitude goes to each corporate partner at the conference for their financial support and technical expertise.